Test machines T1 and T2 are on the same IP subnet and connected to their relivant CPEs. 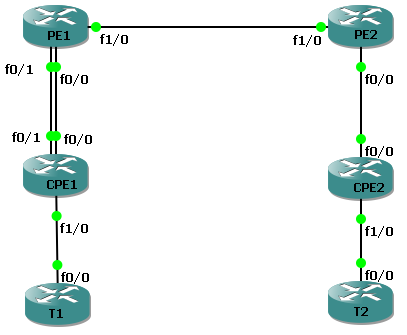 The LAN interfaces on each CPE is a bridge group to a VLAN on the WAN (3-way bridge on CPE1). The PEs operate the redundant pseudowire feature (over MPLS) between the dual access-circuits at PE1 and single AC at PE2. This basic setup has no BFD checking and it's a Y shape AC redundancy topology (SPoF).